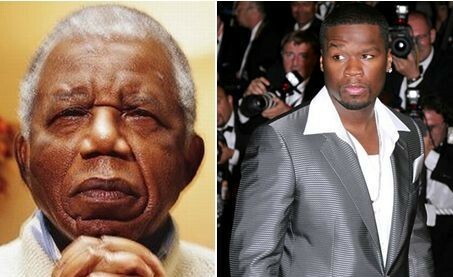 50 Cent has been undone by one of Africa's greatest novelists, Chinua Achebe. The rapper's latest movie has been renamed ahead of its release, due to a conflict with Achebe's most famous work. Things Fall Apart, published by Achebe in 1958, is Nigeria's most famous English-language novel. It has sold more than 8m copies worldwide. Unfortunately, 50 Cent was not aware of this. He spent much of 2010 shooting a film of the same name, the story of an American football player diagnosed with cancer. "It's a project that I wrote, produced and financed myself," he explained last year. Directed by Mario Van Peebles, it premiered at the Miami film festival in March and is expected to be released soon. Unfortunately for Fiddy, his film will not keep its original title. After being contacted by Achebe's legal team, 50 Cent allegedly offered $1m to hold on to the title. Achebe, 80, took this as an insult. "The novel with the said title was initially produced in 1958 (that is 17 years before  was born)," replied his lawyers, according to Naijan. "[It is] listed as the most-read book in modern African literature, and won't be sold for even £1bn." The film has now been renamed to All Things Fall Apart.